A 13th century cottage have been transformed into a bright, contemporary living space with a courtyard, balcony and roof terrace overlooking the charming rise and fall of medieval rooftops and the Alaric Hills, so sunlight is always at hand. On the ground floor there is a long living kitchen area, with wood burning stove, oven, dishwasher and open dining area with utility room and bathroom. 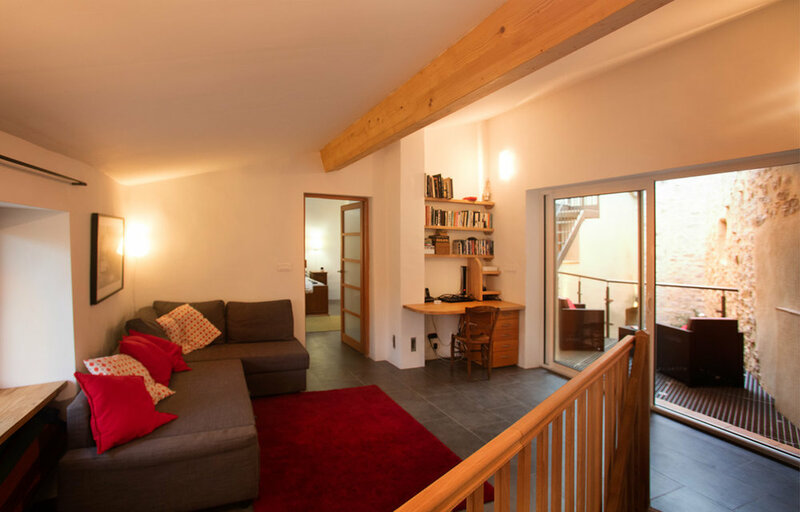 Two staircases lead up to a living area with double sofa bed with a wall-mounted screen that opens onto the mezzanine terrace, a main bedroom, toilet and second bedroom. The house is fully equipped with dishwasher, washing machine, wifi internet, large flat screen TV and laptop [large film library on hard drive and DVD], books, hairdryer, iron and ironing board, board games, maps and guides to the local area. All bedrooms have good quality beds, comfort- able pillows, duvets and towels. [Please bring your own beach towels].